More than cool. Check out our e-newsletters. Own Another Building? With Aging Chillers? 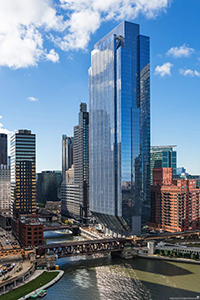 On April 21, Chicago-based developer Riverside Investment & Development marked the grand opening of its stunning 54-story 150 North Riverside office tower in the West Loop. Enwave Chicago began chilled-water service to the building in September 2016. Goettsch Partners’ innovative design of the 1.25 million-sq-ft structure was inspired by the site’s constraints – railroad tracks to the west and the Chicago River to the east. The Class A building cantilevers above rail rights-of-way and minimizes the street-level footprint, occupying less than 25 percent of the total 2-acre site area. The remaining space is dedicated to a landscaped public park, riverside amphitheater and riverwalk. 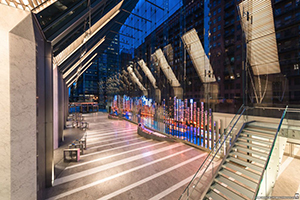 “150 North Riverside is pre-certified LEED Gold. Its sustainable design features high-efficiency plumbing and mechanical systems, a high-performance floor-to-ceiling curtain wall system, open floor plates and lobbies with significant natural daylight. Tenants began occupying the building in February, with 85 percent of the space leased prior to its opening. The property manager is CBRE; consulting engineer-of-record, Magnusson Klemencic Associates; mechanical, electrical, plumbing and fire protection engineer, Cosentini; and contractor, Clark Construction. Enwave Chicago is honored to serve 150 North Riverside, a striking achievement that reveres the city’s architectural legacy. Images: © Nick Ulivieri, Courtesy Goettsch Partners. Enwave Chicago’s parent company Enwave Energy Corporation recently acquired district energy systems in Los Angeles; Portland, Oregon; Las Vegas; and London, Ontario, and Charlottetown, Prince Edward Island, Canada. They join Enwave’s existing systems in Toronto and Windsor, Ontario; Chicago; Houston; Las Vegas; New Orleans; and Seattle. 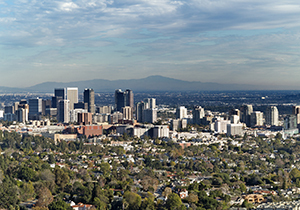 The Los Angeles system serves hotels, office buildings and residential towers in LA’s Bunker Hill and Century City (pictured) neighborhoods. It has chilled-water capacity of 35,300 tons and a 7.8-mile distribution network. The Las Vegas system serves one of the largest resort-hotel-casinos on the main Las Vegas strip and has a capacity of 187,600 lb/hr of steam and 32,420 tons of chilled water. The Portland system serves customers in the Brewery Blocks, a five-block shopping and professional district downtown. It has a chilled-water capacity of 4,530 tons and a 2.5-mile distribution network. Slated for further expansion over the next several years, the London system serves 60 customers with steam, largely for space heating and cooling use. It has a capacity of 200,000 lb/hr of steam and 4,200 tons of chilled water. It sells electricity to the grid from its 18 MW combined heat and power system. The Prince Edward Island system serves more than 100 customers with hot water, mainly for space heating. Its 250,000 lb/hr capacity system is fueled by biomass, municipal waste to energy, and fuel oil (for backup). Enwave Energy Corporation, together with its affiliates, is a fully integrated, sustainable energy services provider owned by Brookfield Infrastructure and its institutional partners. In each community, Enwave operates highly efficient energy plants that distribute steam, hot water and/or chilled water to customer buildings for heating, air conditioning, domestic hot water, sterilization and more. Enwave Chicago received the gold award for growing and retaining 4.9 million of customer space in 2015; it received the bronze award for growing and retaining 4.6 million sq ft in 2014. That’s a three-year growth and retention total of 14.85 million sq ft. 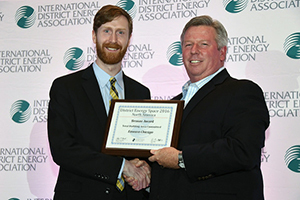 IDEA has held the annual contest since 1990 to recognize the district energy industry's high achievers and tell the story of district energy’s growth. In 2016, reporting North American systems tallied more than 57.8 million sq ft of buildings committed or recommitted to district energy service. Systems beyond North American reported more than 105.3 million sq ft of customers committed or recommitted to the service. The industry continues to grow! If you’ve already met him, we wouldn’t be surprised. 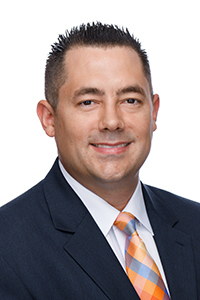 Scott Berg, Enwave Chicago’s new partner relationship manager, hit the ground running when he started here in March. Scott’s been meeting with customers to learn about their buildings and energy needs. Scott may be reached at Scott.Berg@enwavechicago.com, 312.447.1600 x 23. You don’t need to have a new building to connect to Enwave Chicago’s chilled-water system. In fact our district cooling service could be the perfect solution if your chillers are wearing out and it’s time to replace them. Rather than hassle with old chiller removal and new unit installation, just pipe in our chilled water instead. 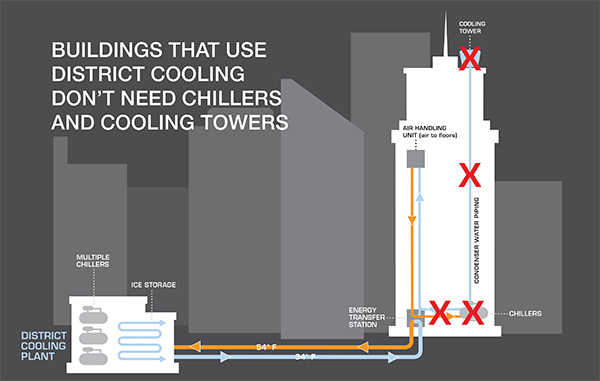 Then you can also eliminate the cooling tower, giving you space for rooftop amenities. Contact Jim Rylowicz, 312.447.1600 x 17, for more information on hooking up another building to our chilled-water system. We continue to add new customers, growing right along with downtown! 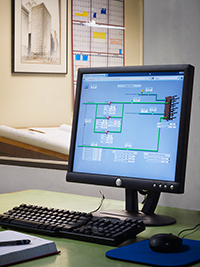 Did you know that you can connect your building automation system (BAS) to our chilled-water system? To tap into this valuable data resource, please contact Scott Berg, 312.447.1600 x 23. He will coordinate the connection with you, your automation contractor and our operations team, which will provide you the data points you’ll need to link Enwave Chicago’s system to your BAS. By tapping into this data resource, you will gain even greater control of your chilled-water consumption, be able to turn the system on and off, and change setpoints. You are receiving this email because you are a customer of Enwave Chicago.